Diamante, 2007, fiberglass, wood, and torn gallery-wall plaster. Installation view. On entering the seemingly empty, almost decomposing space, viewers are hit by an extremely strong smell. Seeking the source of the obnoxious odor, one encounters only crumbling walls with flaking paint, as though an explosion had recently struck or a mysterious plague had swept through the gallery. After closer examination, one realizes the pungent industrial smell comes right out of the walls themselves. 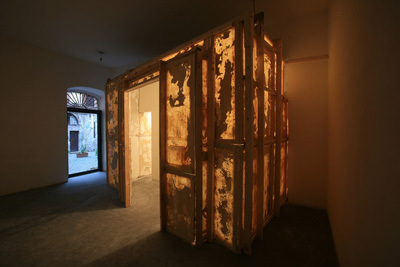 The Spanish artist Jorge Peris was given early exposure to the Italian public at the 2005 Turin Triennale, where he turned a room into a living organism by covering the walls with live molds and bacteria. Here, Peris again explores space and the hidden tensions that creep into our living environments, but this time he literally strips the walls bare. Adopting a similar technique as that used to remove frescoes, the artist glued fiberglass panels to the walls only to tear them away, thus removing the superficial layers of paint and plaster, denuding the walls so completely as to reveal, in some places, the traces of previous colorations or the metal structure sustaining the drywall. In a separate room, Peris entirely rebuilt the gallery itself using the fiberglass panels covered with the residue of the original space. A box within a box, the re-created room stands both as an archaeological relic and a strange organism. It is as though the artist had exposed an excoriated membrane to dry, letting the light filter through its thin skin. By working with subtraction, Peris emphasizes the simplicity of the space by inverting it: No longer merely functioning as support for art, the space becomes art itself.